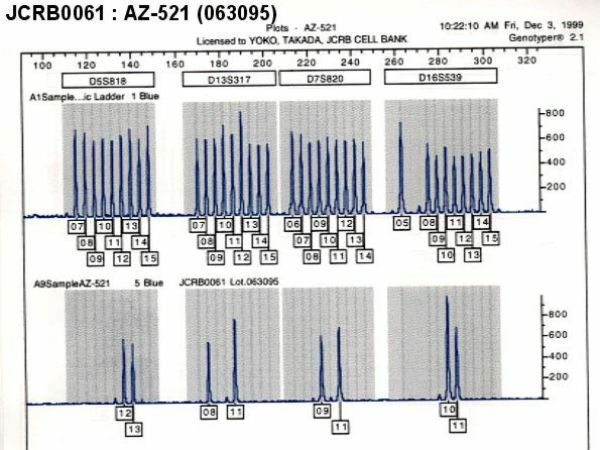 AZ-521 (registry number JCRB0061) cell line was reported to be established from human gastric carcinoma in Japan. However, the STR DNA analysis pattern of AZ-521 revealed to be identical to that of other cell line derived from human duodenum carcinoma, HuTu 80 in ATCC (registry number, HTB-40). This was confirmed by the Sanger Institute's analysis of identities of human cancer cell lines. Since the cultivation of HuTu 80 cells started in 1968 and this cell line was directly deposited at ATCC by original developer in 1973, it is very provable that the AZ-521 is a subline derives from HuTu 80. 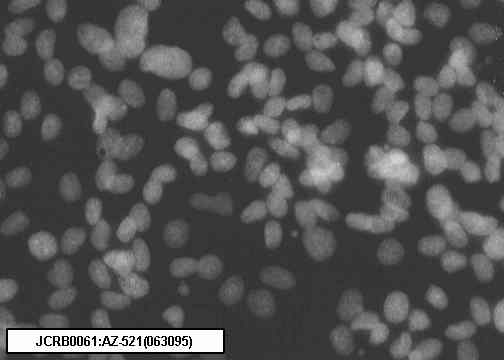 The AZ-521 has been widely used in the world and has been studied as standard cell strain for research of Helicobacter pilori. Therefore the cell bank does not exclude the AZ-521 from the catalogue. 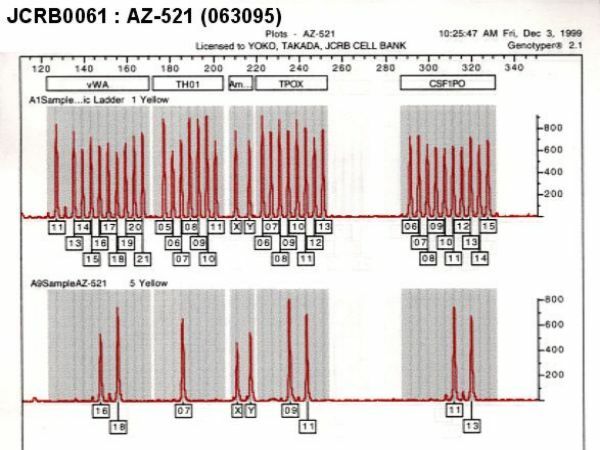 However, please consider and keep in mind in the usage of AZ-521 that the derivation of this cell line has problem. !! the problem of origin exists !! Mycoplasma contamination was detected when submitted to NIHS and eliminated at 1986. Regulation of arginase production by glucocorticoid in three human gastric cancer cell lines. Nuclear granules recognized by some monoclonal antibodies against intermediate filament protein locate on chromosomes during mitosis. Confirmed as human by NP, G6PD (type B), LD, MD. 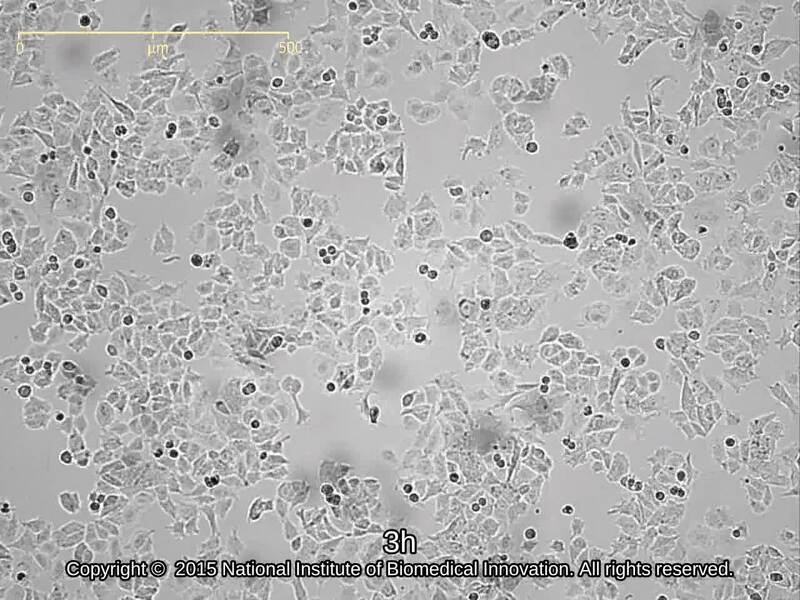 Harvest cells with 0.25% trypsin and 0.02% EDTA.